Now that I am DONE my final exams I promise I will be posting twice a week regularly again! I got a mini size of this primer in my Benefit Advent Calender and tried it out multiple times in different ways. I loved how this primer neutralized the colour on my eyelids but for me personally, I liked this way better as a primer for my under eye concealer than as a base for my eyeshadows. I have literally the oiliest eyelids ever, even on days I don't wear shadows I get oil buildup. I use UD primer potion but even with that sometimes I get creasing even pro longwear paint pots crease on me without using a primer before- I think I need to try the NARS next. I noticed after only about 2-3 hours all my MAC eyeshadows I used had creased. If you have normal eyelids I think this would work great for you, especially because it is a neutral colour to blur out any redness. I found it worked well under my eyes with a concealer on top and then powdered. It made everything look pretty flawless and I was really happy with it. The full size of this sells for $30 CAD at Sephora which is more expensive than most brands of eye primer. 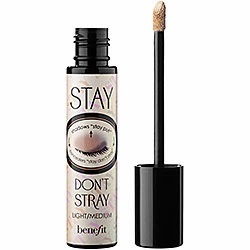 You can use other primers like UD and Too Faced under concealer as well but I don't think the texture is as nice for that as this one, so I think if you're looking for a primer that can be used as an eyeshadow/concealer base and you don't have very oily eyelids you'll really enjoy this product!